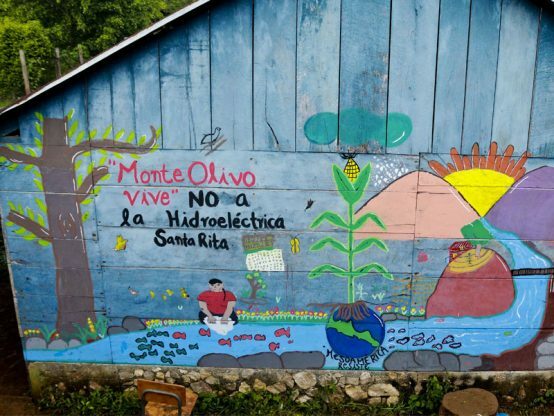 Street art in Guatemala: "'Monte Olive lives', no to Santa Rita dam". Credit: Regeneracion Radio. In late October, the Compliance Advisor Ombudsman (CAO), the accountability mechanism of the International Financial Corporation (IFC), the World Bank’s private sector arm, released a highly critical audit of the IFC’s investment in Guatemala’s Santa Rita hydroelectric dam project. The plant is managed by a local development company, Hidroeléctrica Santa Rita (HSR). HSR was partly owned by Latin Renewables Infrastructure Fund (LRIF), a financial intermediary (FI), in which the IFC made an equity investment in 2012. The IFC stressed in its reaction to the audit that LRIF discontinued its involvement in the project. The audit found that while the IFC correctly categorised the project as high-risk, its “pre-investment review was not commensurate to risk” and the “IFC did not have an adequate understanding [of] the contextual risks associated with its investment”. It further stressed that the IFC “gave insufficient consideration to the challenges that the Fund [LRIF] would face in implementing IFC’s recently updated Indigenous Peoples requirements.” According to a 2015 report The Suffering of Others by several NGOs, including Oxfam International, the IFC claimed as late as October 2014 that “there were ‘no high-risk projects’ funded by their client”. The report argued this initial “assessment entirely ignored or downplayed the fact that the project was situated in an indigenous area”. The report further alleged that only after public exposure of the project did the IFC’s website disclose the project as high risk. The IFC’s initial risk assessment seems at odds with the Bank’s appalling track record in Guatemala, where several hundred indigenous people were massacred during the construction of the Chixoy dam in the 1980s. Additionally, severe conflicts had already occurred at a similar project, Cambalam, where a state of emergency was declared in the same year as LRIF’s investment in Santa Rita (see Observer Spring 2014, Bulletin February 2014). The audit adds to previous concerns raised by the CAO about the IFC’s FI investments in its 2013 FI audit and March compliance report (see Observer Spring 2017). It also comes in the context of an increasing number of cases unearthed by civil society, including the IFC’s support for coal in contravention of the World Bank’s policies, their role in land-grabbing across Africa (see Observer Winter 2017-2018, Summer 2017, Winter 2017) and the World Bank’s push for hydropower beyond Santa Rita (see Observer Spring 2016, Bulletin February 2014). The IFC’s new ‘de-risking’ approach to ‘leveraging’ private sector investment (see Observer Autumn 2017) as outlined in IFC CEO Philippe Le Houérou’s October “letter” leaves little hope that the experience of the Santa Rita community will not be duplicated elsewhere.